Welcome to an archipelago of picture-perfect tropical islands where idyllic beaches, tropical rain forests, ancient temples, and a wealth of cultural heritage await you. Indonesia is home to some of the best snorkeling and scuba diving sites on the planet, where you can enter an under-water wonderland of brilliant coral reefs teeming with marine life – imagine swimming with dolphins, manta rays, and even endangered turtles. When you need a break from the beaches you can explore a wealth of ancient Hindu and Buddhist temple complexes, many of which date back to the 8th century. Your visit would be incomplete without visiting one of the national parks to see some of Indonesia’s most endangered animals and birds, including the fearsome Komodo dragon, the Sumatran tiger and the endearing orangutan. Covering an enormous area of over 40,000 hectares of ancient primeval forest intersected by rivers, savannahs, and mangrove swamps and surrounded by coral-fringed beaches, the Alas Purwo National Park is a veritable playground for all nature lovers. The park is located on the Blambangan Peninsula at the southeastern tip of East Java, directly facing the island of Bali. The park is home to a large variety of endemic animals and birds, including many rare and endangered species, and also attracts thousands of migratory birds each year. 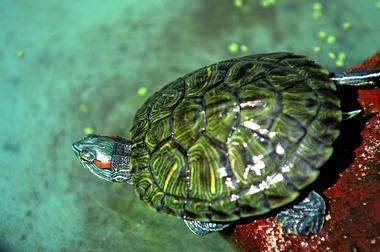 Activities include jungle trekking, bird watching, and turtle observation tours. You can explore by bicycle, visit a few of the many ancient caves, or take a river boat tour. Hidden away in Hulu Quantan in the jungles of Sumatra you can see one of the world’s largest (and most unpleasant) flowering plants, the enormous Amorphophallus titanum, or corpse flower. This remarkable flower is a member of the Arum family and can reach a mature size of over 10 feet in circumference and over 9 feet in height; it attracts pollinating insects with its dreadful smell, which closely resembles that of a decaying body. These mammoth flowers only occur naturally in Indonesia, and you may be lucky enough to come across a flowering plant if you visit the jungles or the botanical gardens in Bogor or Bali between March and October – unfortunately, the rare plant is doomed by its terrible smell, which leads local villagers to destroy the plants. Be ready to pull on some comfortable walking shoes when you visit the sprawling jungle-like Bogor Botanical Gardens, which cover an area in excess of 87 hectares and are home to over 15,000 plants, many of which can only be seen in Indonesia. Besides the abundance of plants, you can also view the outside of the stately Bogor Palace and see the interesting Hand of God and Little Mermaid statues in the palace grounds. The gardens are divided into several distinct sections and contain the Zoology Museum, the Lady Raffles Memorial Monument, an orchid house, a fern collection, a screw pine collection, and the Palm Oil Monument. 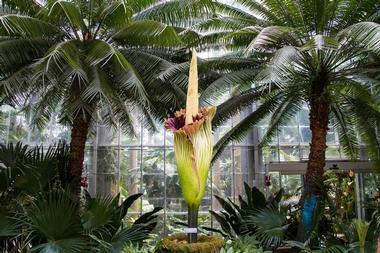 If you visit between March and October, you may to lucky enough to see the incredible corpse flower, or Amorphophallus titanum, in bloom. 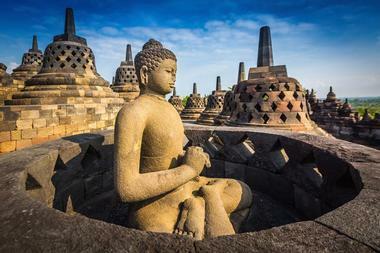 One of the must-see sights in Indonesia, the Borobudur Temple was built in the late 8th century and was then mysteriously abandoned sometime during the 14th century – for hundreds of years the impressive temple languished in the jungle until it was re-discovered in 1814. The massive complex that you can visit today must have taken an army of laborers to construct and as you make your way along the guided path to the top of the complex you will pass no less than 500 Buddha statues and hundreds of carved reliefs that document daily Buddhist life in Java. This popular UNESCO World Heritage Site is open to the public from 6:00am to 5:00pm daily and if you are staying overnight in one of the local hotels, you may be able to get an earlier entrance slot. 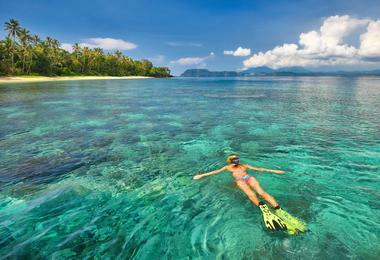 Bunaken Island is a small island of around 5 square miles in the Bay of Manado, north of Sulawesi in Indonesia. The island is surrounded by the crystal-clear waters of the Bunaken Marine Park, which provides visitors with some of the best dive sites to be found in Indonesia. The tropical waters are home to no less than 13 species of coral reefs, and the entire marine park is teeming with spectacular marine life. You can explore the underwater wonderland using scuba or snorkel equipment and enjoy boat trips between the various dive sites. You can also explore the island on foot, stopping here and there to soak up the sun on the beaches or cool off in the ocean. 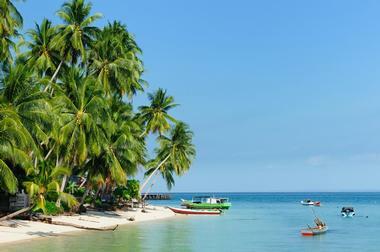 You can reach the island by boat from Manado. Located just off the mainland of East Kalimantan, the Derawan Archipelago comprises 31 tropical paradise islands just waiting to be explored. These picture-perfect tropical islands are the perfect antidote to life in the fast track – here you can spend your days island hopping, snorkeling, scuba diving, kayaking, and soaking up the sun. In addition to all the above activities you can also look forward to watching endangered green and hawksbill turtles dragging themselves up the beach to lay their eggs on Sangalaki Island, where divers can often swim with these wonderful sea creatures. Karaban Island is a marine conservatory where you can swim with stingless jellyfish and explore hundreds of species of coral and marine life. 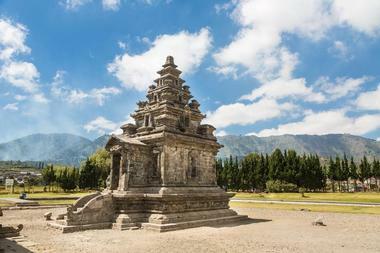 Nestled in the heart of volcanic Mount Prau’s caldera in central Java, the Dieng Plateau is known for beautiful landscape and a collection of eight ancient Hindu temples. The plateau lies at an altitude of over 6,500 feet and provides a welcome escape from the heat of the lowlands. Besides viewing the temples, which date to somewhere between the 8th and 13th centuries, you can rent a motorbike to explore several geothermal sites (the plateau is still an active volcanic area) and see the famous colorful lake, Telaga Warna. The area is popular with hikers and trekkers and there are a few hotels on the plateau where you can stay overnight to observe the magical sunrise from the summit of Mount Sikunir. 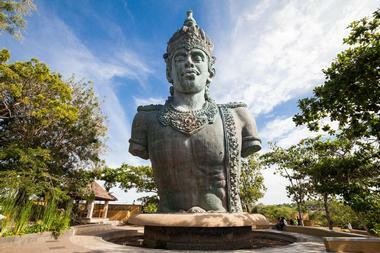 No visit to Indonesia would be complete without learning a little about the fascinating culture of the Indonesian people, and the Garuda Wisnu Kencana Cultural Park near Badung is waiting to welcome and educate visitors about local history, culture, and religion. At the center of the impressive complex, an enormous statue of the Hindu god Vishnu riding the mythical bird Garuda (which is the cultural icon of Indonesia) is currently under construction. When the enormous statue is completed it will rival the Statue of Liberty in size. You can explore the complex on foot (or have some fun on a Segway tour). Don’t miss the daily demonstration of Balinese dance and music. The picture-perfect Gili Islands are located off the northwest coast of Lombok, offering an ideal tropical island getaway where you can relax and recharge. 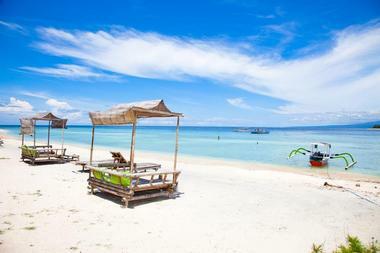 Gili Trawangan is the largest of the three Gilis, while Gili Meno has the most remote Robinson Crusoe-like atmosphere. The idyllic islands are devoid of all forms of motorized transport and the best way to explore is to rent a bicycle or go island hopping by boat. All three islands are surrounded by miles of pristine beaches and offshore you will find some of Indonesia’s most spectacular diving and snorkeling sites, where it is quite common to spot the rare green turtle. There are several bars and restaurants where you can enjoy cocktails as you watch spectacular sunsets. The Goa Gajah archaeological site (aka Elephant Cave), is one of Bali’s most spiritual Hindu sites, located near the city of Ubud in the Sukawati region. The entrance to the cave is rather ominous and resembles the gaping mouth of some kind of demonic creature – it is thought that this carved entrance was intended to scare off bad spirits. Visitors are often struck by the sense of serenity they experience when visiting this ancient holy site, which Hindu devotees used for meditation and which is still a religious site today; you will need to dress appropriately if you wish to enter the cave – knees and shoulders should be covered. If you take the time to travel up into the mountainous area southeast of Padang, you will be able to cross one of the world’s most curious bridges, which was originally engineered using just the roots of two banyan trees. 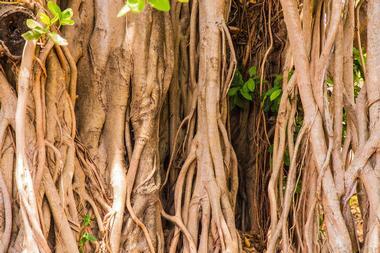 The amazing structure which you see today has taken over 26 years to establish, using a simple bamboo frame to shape and guide the aerial roots of the banyan trees located on either side of a river until a 100-foot span of woven roots was created. Eventually Mother Nature was assisted by the use of some wooden planking and metal cables, as well as some guide lines for tourists wishing to cross from one side of the river to the other. When you feel like a change from Indonesia’s beautiful beaches and dive sites you can visit the remarkable Kelimutu Volcano on Flores Island to see one of nature’s most brilliant geological sights. Here you can explore a unique landscape of volcanic craters filled with brilliantly colored lakes, thought to be the result of chemical reactions to the minerals in the waters, triggered by volcanic gas activity. The blue lake is called Tiwu Ata Mbupu (Lake of the Old People), the green lake is Nura Muri Koo Fai (Lake of Young Men and Maidens), while the vivid red lake is known as Tiwu Ata Polo (The Enraged Lake). 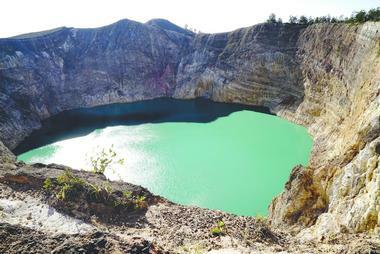 Kelimutu is a magical place to visit and a must-see attraction for geologists and photographers. The fearsome Komodo dragon is the world’s largest lizard and is only found in Indonesia, where its name derives from its reputation for aggressive behavior and its frightening appearance. If you would like to see one of these exceptionally rare creatures, you will need to plan a visit to Komodo National Park, located on a group of volcanic islands found between Flores and the Sumbawa Islands. The park is home to around 5,700 dragons, which you can see on a guided tour or by booking a private boat ride to the park. Brave explorers can go an adventure trek around the park, which takes between 4 and 5 hours. In addition to the dragons, you can also expect to see other endemic reptiles and some larger mammals in the park. 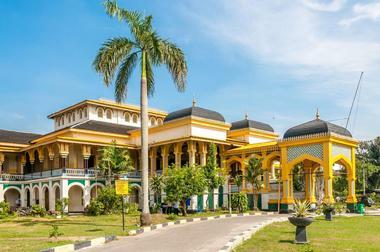 The Maimun Palace (aka Maimoon Palace) is a well-known landmark in the city of Medan in north Sumatra. The impressive building was once the palace of the Sultanate of Deli and was built between 1887 and 1891, utilizing a variety of architectural styles that will be of interest to history and architecture enthusiasts. Today the building is operated as a museum and you can expect to see examples of Dutch, Islamic, and Indian architecture combined with Spanish and Italian fittings and furnishings. You can hire traditional Indonesian costumes for a fun photo-shoot and enjoy listening to local Indonesian musicians providing background music. 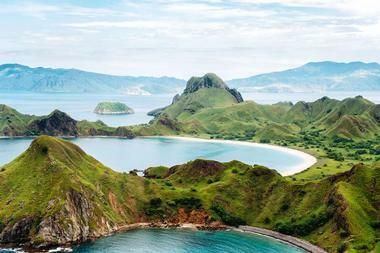 Padar Island is found in the Indonesian archipelago, approximately 20 miles from the fishing village of Labuan Bajo on the west coast of Flores Island. 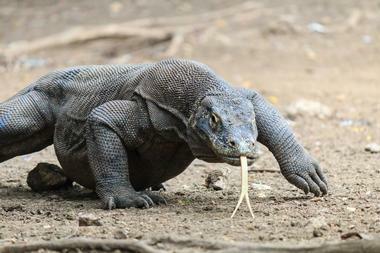 The island forms part of Komodo National Park – however today you will not find any dragons on this island. The main drawcard of Padar Island is its beautiful beaches, which include a rare pink sand beach containing crushed coral, a black volcanic sand beach, and a pristine white beach. You can look forward to some excellent diving and snorkeling – there are regular sightings of sharks, manta rays, dolphins, and turtles. If you enjoy hiking, you can pull on some boots and make your way to the summit of the island in around 30 minutes or trek around the perimeter in about an hour. 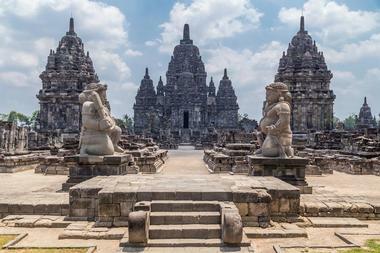 Indonesia’s exceptional Prambanan Temple Complex is a must-see attraction for anyone interested in history, art, and ancient architecture. 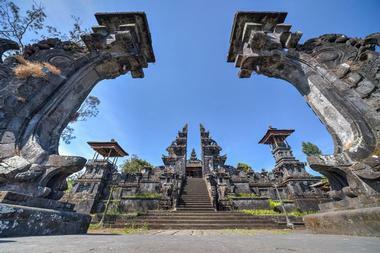 The complex is a UNESCO World Heritage Site and can be reached from either Yogyakarta or Semarang. The sprawling temple complex, which was built in the 9th century, covers nearly 40 hectares and contains around 500 individual temples and shrines dedicated to both Hindu and Buddhist deities, demonstrating a remarkable example of religious tolerance. You can expect to see exceptional examples of stone masonry and advanced methods of building technology on a grand scale – the tallest temple is a staggering 150 feet tall and can be seen from several miles away. 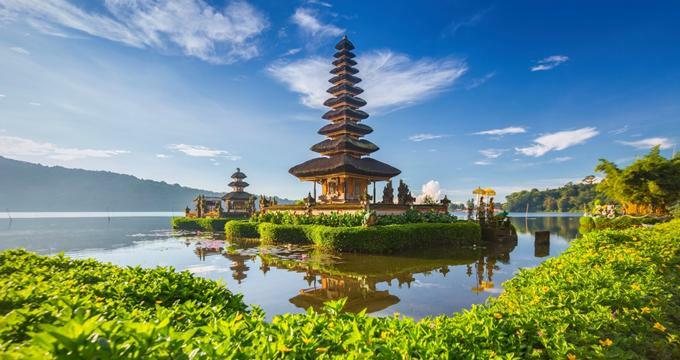 Located on the south western slopes of Mount Agung in Bali, the Besakih Temple has been recognized as the “Mother Temple” of Bali for over 1,000 years. You can tour the sprawling temple complex, which boasts at least 86 individual temples, on your own or with the help of a local guide or “temple guardian,” who will help you to understand the various aspects of the complex. It is necessary to dress appropriately when visiting the temple, with shoulders and knees covered – you can buy a sarong and sash at the temple if you don’t have appropriate clothing with you. The temple complex is surrounded by terraced gardens and you will get wonderful views of the surrounding rice paddies and superb scenery from the top of the complex. 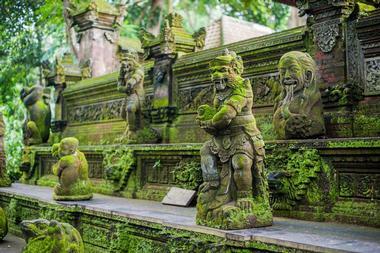 At the Sacred Monkey Forest in Padangtegal in central Bali you can enjoy exploring a spiritual temple complex that is also a sanctuary to over 700 free-ranging monkeys. The Sacred Monkey Forest covers over 27 acres of forest, where you can see a variety of local trees and plants as well as a large population of birds, reptiles, and small animals. You are free to wander along the pathways surrounded by the resident monkeys as you visit the various ancient temples and shrines, some of which date back to around the 13th century. There is no doubt that the monkeys are the main attraction at the forest, offering visitors a chance to view their antics at close range – vendors are strategically positioned selling bananas, which you are allowed to offer to the mischievous monkeys, although bear in mind that they remain wild animals, not pets. Indonesia has a wealth of ancient temple complexes to keep even the most ardent historians busy exploring, and as the second largest Buddhist temple complex in Java, Sewu Temple in Yogyakarta deserves a place on your itinerary. 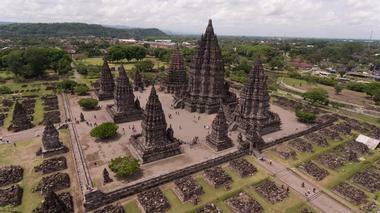 Located just over a mile from the Prambanan Hindu temple (and included in the entrance fee for the Prambanan Temple Complex), Sewu Temple is an indication that ancient Buddhists and Hindus lived peacefully side-by-side. You will find that the central Mahadeva Temple is surrounded by four circles comprising no less than 250 lesser temples ,and it is thought that the complex was built during the 8th century. Located in East Jakarta, Taman Mini (Beautiful Indonesia Miniature Park) is a recreational theme park that encapsulates and showcases Indonesian life and culture in a nutshell. As you make your way through the various pavilions, you will be introduced to all aspects of life in the country, including traditional dancing and theater, clothing, architecture, and much more. 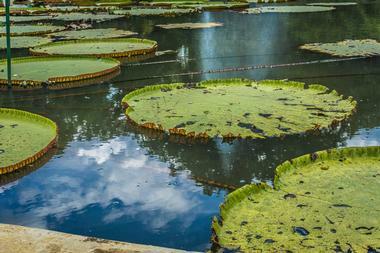 At the heart of the complex you can see a representation of the entire Indonesian archipelago in a manmade lake. Highlights of your visit will include the cinema, cable car tour, and the Theater of My Homeland. 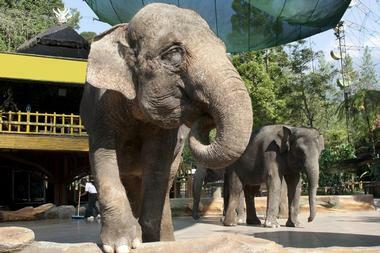 In addition, you can wander through ten themed gardens and visit the Bird Park, Zoo, and Reptile Park. Taman Safari actually consists of animal theme parks located in three separate locations in Indonesia where you can get up close and personal with a variety of wildlife in natural settings. 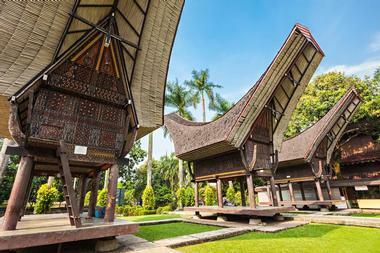 The parks are located in Bogor, West Java, Mount Arjuno in East Java, and at the Bali Safari and Marine Park. The parks protect and showcase over 2,500 animals from Indonesia and the rest of the world, which you can see on guided tours in safari vehicles by attending the various daily shows. Highlights of your visit could include coming face-to-face with a stunning Sumatran tiger or an endangered rhinoceros, swimming with dolphins, playing with orangutans, or seeing the fearsome Komodo dragon. Precariously perched on the top of a craggy cliff high above the pounding waves of the ocean, the Tanah Lot Hindu Temple forms one of the six spiritual pillars of Bali, which are believed to protect the island from bad spirits. 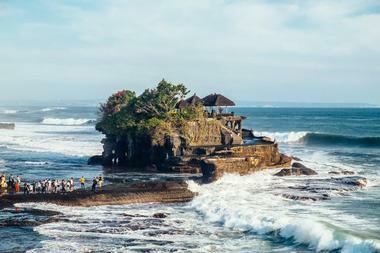 On the beach below the temple, waves have carved out a complex of sea caves, which locals believe to be protected by sea snakes – hence Tanah Lot is also known at the Snake Temple. At low tide you can approach and explore the outer caves (provided you are unafraid of the real or mythical presence of snakes) and receive a blessing from the priests. A good way to see Tanah Lot and the other temples that protect the island is to hire a car and driver to take you from temple to temple. 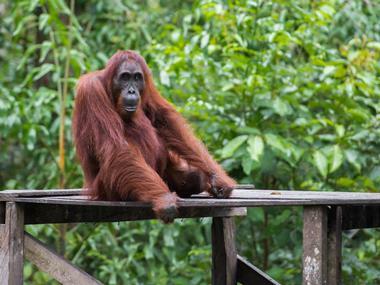 Visiting Tanjung Puting National Park in Kalimantan is one of the most memorable experiences that visitors to Indonesia will experience and is a definite bucket-list adventure for nature lovers and primate enthusiasts. The vast national park is one of the last remaining stretches of virgin Indonesian rainforest home to the exceptionally endangered orangutan as well as the fascinating proboscis monkey and many other species of animals, reptiles, and birds. The best way to experience nature at its best is to join a 3-day/2-night tour on a klotok (simple wooden boat that becomes your floating home) and drift down the river to visit the various feeding platforms, where you can come face-to-face with the gentle orangutans. You will have the chance to hike through the forest, observe the orangutan’s natural behavior, and savor great Indonesian cuisine. 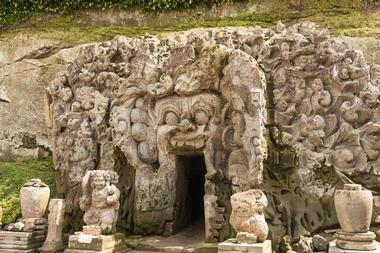 Located in the Kaliurang Highland of Yogyakarta in Java, the Ullen Sentalu Museum showcases Javanese culture and art. The museum is home to a diverse collection of Javanese photos, masks, statues, carvings, and textiles – one entire room is devoted to showcasing fine examples of batik. 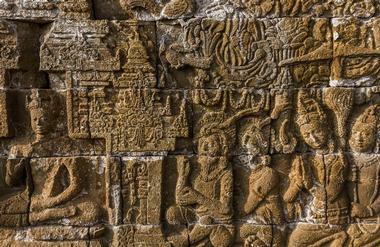 There is an outdoor area where you can see ancient statues of gods and goddesses from the 8th and 9th centuries. You will need to join a guided tour to explore the museum and no photography is allowed in the interior galleries. At the end of your tour you can enjoy the gardens, have a snack at the café, and pick up some souvenirs at the gift shop. 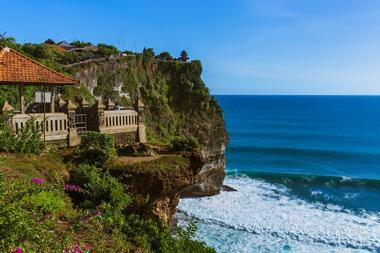 Located on an elevated cliff top on the west coast of Bali about 15 miles from Kuta town, the Uluwatu Temple is believed to be one of the six spiritual pillars of the island. The cliff top site has hosted a succession of Hindu temples since as far back as the 11th century and the current temple complex includes a very attractive pagoda, some ancient stone arches, and a protective stone wall to prevent visitors from toppling over the steep cliff side to the beach far below. Uluwatu Temple offers one of the best sites in Bali from which to watch fiery Indonesian sunsets and it also hosts a nightly performance of the Kecak Fire Dance – a fascinating cultural experience for all visitors.